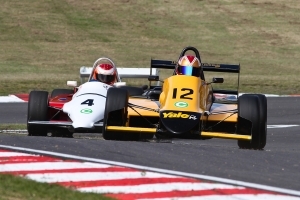 Mono Classic 2000 is a popular class for classic cars such as Formula Vauxhall Lotus and older F3 cars, like Reynards and Ralts. Chassis of aluminium alloy and/or steel construction where the manufacturer's designated model year is 1993 or earlier. Chassis of carbon fibre composite or aluminium alloy construction originally complying, or derived from those originally complying, with FIA Formula 3 and identified by the manufacturer as for the model year 1992 or earlier. Standard production engines up to 2000cc capacity. Dry sump lubrication permitted. Steel flywheel minimum weight 3.6kg. carburettors or original spec fuel injection. Engines of manufacture and model as used in FIA international Formula 3 during 1992 or earlier, having a 25 millimetre maximum diameter air restrictor through which all air serving the induction is passed. For full information, please consult the technical regulations.